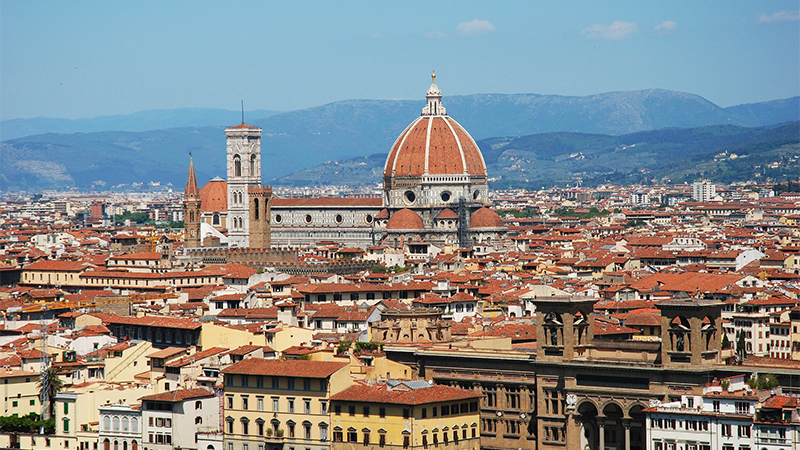 Florence is a historic city of uncommon beauty and importance in European history, arts and humanities. While gaining an appreciation of medieval and renaissance Florence, experience contemporary life in this thriving, bustling city in Italy. Smith student applications are due on the first Monday in February (February 4, 2019). Guest students are encouraged to apply by the February deadline but will be accepted on a space-available, rolling basis up until the second Monday in March (March 18, 2019). The Smith program in Florence offers a curriculum for a full year abroad, as well as an option to study in Florence for a single term. The full-year program begins with four weeks of intensive language study, cultural orientation, an art history course and excursions. During the fall semester, students take classes at the Smith Center ("Sede") and audit one course at the University of Florence. In the spring, students take one or two courses at the University of Florence and two or three Smith courses at the Sede. Tutorials are arranged in conjunction with the university courses.The fall and spring terms program begin with an abbreviated version of the orientation program described above in the full year curriculum, and then mirrors the full year fall/spring term curriculum. Academic Coordinator: Guido Reverdito, Ph.D.
Over three weeks, students take an intensive Italian language course at the Smith Center ("the Sede"), as well as an Art History course focusing on Medieval and Renaissance art in and around Florence. In addition to the two-credit academic orientation, there is a Cocurricular Orientation organized by a recent graduate of the University of Florence. Students meet in small groups with Italian students and explore the city, get introduced to the transportation system, the best parks, shops, markets, libraries, and all the cool places where Italian students gather to eat, drink, listen to music, dance, and talk. Students enroll in 36 Smith College credits: 16 credits per semester, 2 orientation course credits and 2 credits for written work associated with the fall semester audited university course. Smith's long-standing relationship with many Florentine and Tuscan organizations has resulted in a wide variety of possible part-time internship and volunteer placement opportunities for students. Serving as an intern or community volunteer is a fantastic way to meet local Italians, understand Italian society and culture, and to offer reciprocal benefits to the community from which you are learning Italian language and culture. Many of these internships have resulted in research proposals for summer International Experience Grants or prospective Fulbright research proposals. A limited number of year-long internships are available at the Pistoia Early Childhood Centers for 4 credits. The internship course is graded and requires a presentation and a major research paper. The internship can take the place of a Smith course, but not a university course. Located in the heart of medieval and modern day Florence, the spacious Smith Center (Sede) is situated on the central square, the Piazza della Signoria. The center is equipped with computers, internet, printers, and a scanner, as well as several large classrooms and the offices of the faculty director and associate director. As the oldest U.S. program in Florence, Smith's faculty directors have welcomed students to the Sede since 1931. A panoramic view of the main artists of the Renaissance present here in Florence. The site visits richly illustrate their works and vividly bring home the realization that they were created here as an integral part of the Renaissance culture. Artists studied: Andrea del Verrocchio, Antonio del Pollaiolo, Sandro Botticelli, Domenico Ghirlandaio, Filippino Lippi, Michelangelo, Perugino, Raffaello, Leonardo, Fra Bartolomeo, Andrea del Sarto, Pontorno, Rosso Fiorentino, Bronzino, Vasari. A multidisciplinary approach to contemporary Italian culture. It also takes into account the historical reasons for the current political situation. The course offers an overview of Italian 20th century history and includes the study of important aspects of Italian life: regional differences, local identities, emigration and immigration, the integration of recent immigrants into Italy, internal fighting during WWII, terrorism in the late ‘60s and 70s, organized crime and the Mafia, Italian politics, sport, the evolution of the concept of family and the role of women in society. A review of basic and advanced language structures. It includes a variety of activities to learn different linguistic registers: collaborating with a local radio station, visiting a newspaper, preparing video material and improving linguistic skills through a full immersion in the city and in Italian life. This is a required course for all students unless they place out of this language level. Since the foundation of the Slow Food movement, but also from its very origins, Italy has been synonymous with an appreciation for good food. This course examines the social and historical evolution of the production of food and the impact on Italian society. The site visits provide a compelling argument for both the ethics and superior quality of sustainable food. This course approaches sustainable food from both a social and historic aspect, which includes the study of new alternative distribution channels, ew and old production techniques that respect animals and the environment, culinary history and the origin of Italian cooking traditions, the impact of Italian cuisine, and food production and eating habits on Italian culture. Tatawelo, sustainable coffee production and distribution. Students are asked to audit, once a week, a course at the University of Florence. They are also asked to write weekly diaries about their experience. The Director reviews these diaries and meets with the students to discuss their experience and to help them prepare for University of Florence classes in the Spring. This course is graded S/U only. The course will focus on the workshops of Florentine painters in the fifteenth century, examining the different kinds of workshops, their organization, and the relationship between painters and artistic production. After discussing the problem of artists’ training, the course will examine the different types of production, specifically those destined to furnish homes and decorate churches. Master-apprentice relationships will also be examined (Verrocchio and Leonardo, and Botticelli and Filippino Lippi) and the familial qualities of some workshops (e.g. the Pollaiolos and the Ghirlandaios). We will try to recreate the everyday life of a Renaissance atelier, observing drawings that portray artists at work and reading about their jokes and pranks. This course analyses the origins, evolution, decline, re-birth and finally, the most recent developments of Italian fashion, from the Renaissance up to contemporary Made in Italy. The approach is an interdisciplinary one in which the various manifestations of Italian fashion will be examined in relation to such fields as history and art history and viewed in an economic, social and international context. The relationship between fashion and cinema, photography, the Web, journalism and social media will also be examined. The course has been constructed as a kind of journey in time and personal experience. Along the way students will encounter people that, in one way or another, share a similar experience of coming into contact with - and being immersed in - a culture other than their own. Travelers along the same road who are certainly less fortunate than the students, both in terms of their point of departure and that of arrival, but who, at the same time, have to come to terms with their own past and with an identity that is both enriching and in flux. Students who have taken basic Education Courses at Smith can apply to participate in this program. Interns are each allocated a school: either a Nido for infants and toddlers Â or an early childhood school for 3-5 year olds. Each student spends one day a week observing and interacting with the children under the supervision of the head teacher. They are required to write up their observations in a diary and discuss them each week with the supervising teacher, read related articles, and take part in several extra meetings with teachers and parents over the course of the year. In May each student gives an oral presentation in her own school with visual documentation describing an aspect/aspects of her experience. This course designed specifically for spring-only students is a three-week Italian Language module meant to provide a thorough review of some of the most important grammar and syntax structures already covered and to develop advanced writing skills in order to manage assignments and exams at both the Sede and the University of Florence. The second part of this survey of Italian literature builds on the writers studied in Survey 1 and covers the period from the 1600s to the 1900s. The course will focus on the ideas and movements - scientific, social and literary - of the different periods and examine how they found expression in the literature of the time. Writers examined will include, among others, Galileo Galilei, Carlo Goldoni, Casanova, Cesare Beccaria , Giacomo Leopardi, Alessandro Manzoni, Giovanni Pascoli, Giovanni Verga, Luigi Pirandello, Eugenio Montale & Italo Calvino. This is a required course for all students. All students take one or two 4-credit courses at the University of Florence during the Spring semester. This involves attending between 4 and 6 class hours per week. 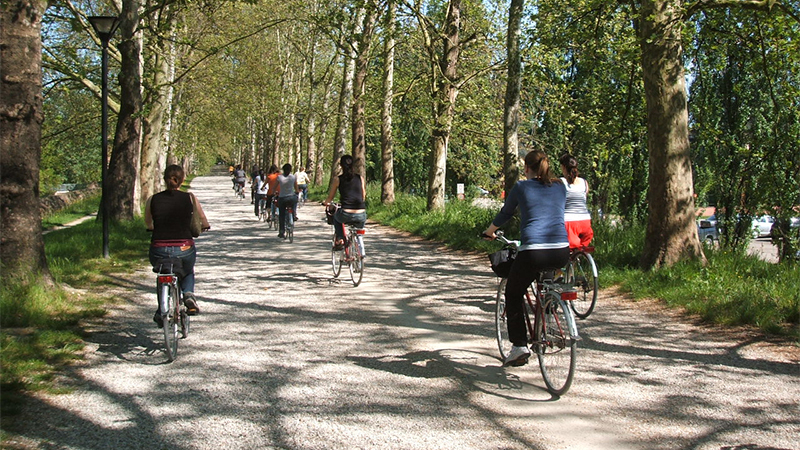 Students live in Florentine homes, situated either within the city or nearby in the Tuscan countryside. By boarding with an Italian host family, a student can learn a tremendous amount about Italian culture and make significant progress in speaking Italian. Many students say this experience is one of the most rewarding aspects of their year abroad. Students typically share breakfast and dinner with their host families. The program provides a monthly allowance to cover lunch costs. A wide range of activities are available in Florence, including guided trips to culturally and historically significant locations that students might not otherwise reach. Excursions include a trip up winding mountain roads to the tiny walled town of Urbino, one of the central locations of the Renaissance; a visit to Ravenna to discover the town that was once the Western seat of the Roman Empire, gaze at intricate Byzantine mosaics, and pay homage to Dante's tomb; and a day picnicking and wandering through the Val D'Orcia region, forever embodied in paintings of rolling hills and cypress trees. Other excursions may include Ferrara, Pompeii and the Amalfi coast. In the early spring, after the fall semester classes and exams are finished, the group adventures to the southern island of Sicily. Circumnavigating the island, students experience for themselves the rich cultural diversity that has formed the historical island. Marvel at the Grecian archeological sites still standing today in the Valley of the Temples in Agrigento, the baroque architecture of Catania and the original seat of the Sicilian Empire in what is now the thriving modern city of Palermo. And of course, there is ample time for relaxation in the sun the island is named for, as well as to experience the unique Sicilian cuisine. Please be sure you meet Smith College's eligibility requirements for approval to study abroad. In addition, Smith in Florence has its own program-specific requirements. All students are advised to throughly understand the visa application process for their destination country before making any summer plans including summer jobs that take them out of state or international travel. The Italian government requires all students staying longer than three months to obtain a student visa before arriving in Italy. Smith's Office for International Study will facilitate a group visa application for students who are accepted on the Smith in Florence program. Students should not make international travel plans in the summer preceding the year in Italy. Students must have a passport that is valid six months after the end of the program and submit a copy of their passport with their Smith program application form. Proof of passport application or renewal is acceptable. The Italian visa process is complicated and requires submission of passports to the Italian consulate in Boston for a period of two to four weeks. The specific date of Smith's visa appointment depends upon the Italian consulate's availability, and can't be set until mid-May at the earliest. Once the consulate issues the visas and returns the passports to Smith, the Office for International Study will send each student her passport with visa via courier service. Again, students who wish to study in Italy should not make international travel plans in the summer preceeding their year in Italy. Please note that students who stay in Italy during the summer are responsible for all living expenses, visa requirements, medical insurance, etc. For resources and information about the Italian visa application process, please visit the Florence Accepted Students website.